Seated beside his wife Mrs. Joy Ogwang and their son Jolly Joe Odongo at the orthopedic workshop in Gulu referral hospital, Inspector of Police Nelson Omara Ogwang is fading away without assistance from the force. His Khaki short hides his amputated lymph inside it as if it was a fashion for men with the same condition, also admitted to the orthopedic workshop, where a wheeling chair is like a game on the pitch. Born in Oduu-Odyek village in Bala Sub-County in Kole district, Ogwang could not believe he would fall from grace to grass. He joined the police force in 1989 from Apac district where he served for 25 years rising from the rank of corporal to Inspector of Police. His desire to join the force and serve his country was triggered by the art and science of community policing. His woes started in 2008 in Kole police department as a mere pimple like swelling on his left foot. He says whenever he took a bicycle ride of about 300miters; he felt pain and had to stop for a rest. “Then I started developing pimple like swellings on my foot and whenever I pierced it, the area turned dark and bloody,” he says as his eyes twinkle fast in the middle of his next sentence. Ogwang has ten children; four are attending secondary school now whilst others have dropped out to attend to their father. 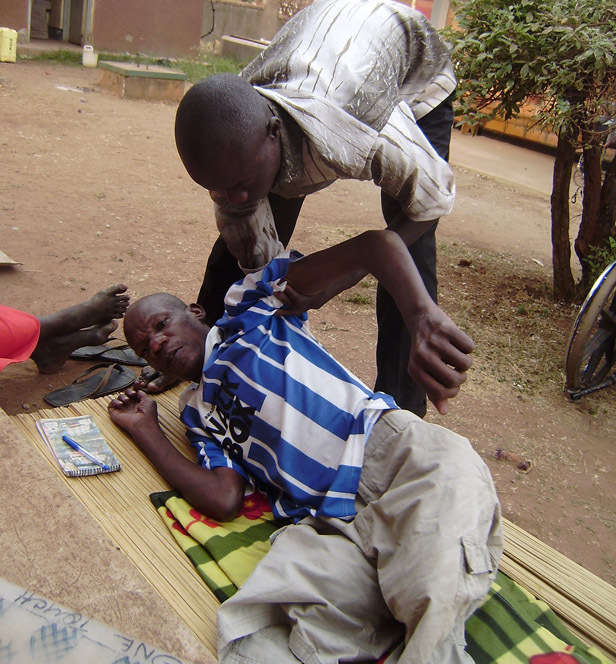 At the on-set of his disease, even the most expensive clinic in Lira town could not help him until he was transferred to Lira Hospital in 2008. He is angered by the manner in which Lira Hospital built hope in him, then doctors referred him to St Mary’s Hospital Lacor in Gulu district on February 19 2008. At Lacor, he was diagnosed with Gas Gangrene a medical condition arising out of viral infection of the skin pores thus blocking the normal flow of blood. “When doctors told me they will cut my leg, I lost vision and imagined another world,” he says. His first left leg was amputated at 2:45pm on February 19, 2008 the same day he was admitted at Lacor hospital. Fortunately, he was discharged on 15th July 2008 after his wounds had healed. He says on his return home, after two days he was taken back to the hospital again with the same problem on his right leg. He further added that he developed pimples like swellings and pus on the foot and leg and his relatives took him to Aboke Health Center IV for wound dressing but it worsened. “I started losing energy and my jaws got stuck to each other; eating and talking was impossible,” Ogwang narrates. Unconscious, he was later rushed for oxygen at the Intensive Care Unit of Lacor hospital where he spent 20 days. When he gained senses, he says doctors decided to amputate his second leg on August 19th 2013. As the wounds were healing, he says suddenly they all turned septic. 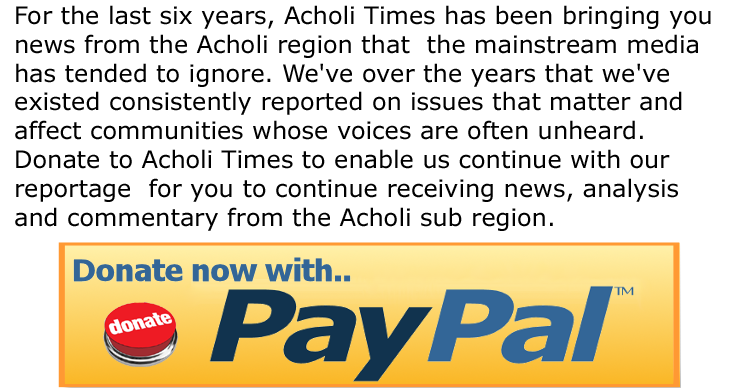 He says the burden of footing the medical bill was solely on him. Asked whether the Police headquarter came to his support, he responds in the negative by shaking his head. “My district Superior took my file to Kampala but he was turned down due to surgeon recommendation, by this time I was very weak,” he says. He recalls that it was his comrades in Kole district police department who contributed shs135000 in solidarity. Amidst all the pain, he boasts of leaving a legacy of crime reduction in Apac communities and a good name among his peers. Despite all the odds, Ogwang still loves his job. But one thing that troubles him his is the lack of a wheel chair to allow him to go back home. “If they (government) have mercy, let them turn and look at me, that I need a wheel chair and money in appreciation for my service,” he appeals. 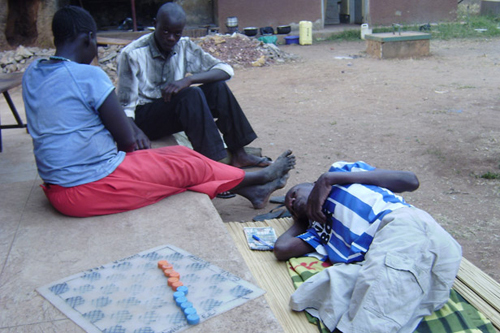 On February 26, 2014 Ogwang was moved to Gulu Regional Referral Hospital Orthopedic workshop to “beg” for artificial limbs to be fitted without any costs, since the money he gets cannot pay for the artificial limbs. At the hospital, his son Jolly Joe Odongo 16 carries him by his shoulder in case he needs to change locations. Odongo never went back to Allied Secondary School to sit for his promotional examinations because he felt that his father was not being supported by any government institution. “It’s tiresome but I love my father, the pain is inside my heart that a bread winner wears at our watch,” Odongo says in a choking speech. However, he always engages his father in a game of Drafts in an effort yo make him forget his worries. As Inspector of Police, he earns a salary of shs350,000 monthly. The figure is far too low to enable his children go to school. The farming which he used to supplement his family income cannot happen now. “The work is overwhelming, it’s me to get food, pay fees and go to farms, we miss Ogwang, a hardworking man,” his wife says. The Police surgeon Dr. Bernard Ndiwalana examined Ogwang and made reports to the Police headquarter in February, but there has been no response. He says that he has examined the amputee and described him as a sick and wasted man. Dr. Ndiwalana advised the Police headquarter to retire Mr Ogwang with all his retirement packages on medical ground. The Region Police Spokesman Mr. Jimmy Okema Patrick has equally appealed to the District Police Commander of Kole district and the Assistant Commissioner of Police for the Lango Sub-region to formulate a report backing up the surgeon’s recommendation to help Ogwang. “Then the report can be forwarded to Police welfare department in Kampala for sanctioning,” Okema says. Though all efforts have been tried, it looks uncertain whether Ogang will be able to travel back to his village without any financial support. “I was on the pulp of Grace now am like a dry grass. When you have a problem, do not run away from it; because it belongs to you,” Ogwang noted. Ogwang was born in 1959 in Oduu-Odyek village in Bala Sub-county in Kole district. He is married to Joy Ogwang with ten children, half of whom are in secondary schools. He joined the police force on March 1st 1989 and trained in Singo military Academy before he was taken to Masindi police training school where he completed in 1990. He was then deployed to Apac district in 1990 as constable but got his promotion to the rank of corporal on June 1st 1995 due to his hard work and discipline. He was later promoted to the rank of sergeant on April 1st 2000 and posted to work in Akokoro Sub-county in Apac district. In 2006, he was transferred to Kole district and promoted to the rank of Assistant Inspector of Police (AIP).